The Pittock Mansion in the West Hills is Portland’s own “Hearst Castle.” It was built in 1914 by Oregonian newspaper founder and publisher Henry Pittock and his wife Georgiana. Many would say that it is the grandest of the great homes of early Portland. Descendants of the Pittock family lived in the house until 1958. In 1964 it was purchased by the city and, after an extensive 15-month renovation, opened to the public in 1965. It has remained a community landmark ever since. Towering 1,000’ above the city, the mansion provides a stunning view of downtown, Mt. Hood, and the Cascade Range. The 46-acre site includes the mansion itself, a three-car garage, a greenhouse, and a gate-lodge servant’s residence. The mansion is open daily for visitors. There is a small admission fee (see page 9). No one can say they have truly seen Portland until they visit the Pittock Mansion. The mansion was designed by architect Edward Foulkes in 1909. Design revisions and construction took five years more. The building’s exterior can best be described as French Renaissance style with its elegant curves, steep roofline, and pointed turrets. The interior is more eclectic with elements of English Tudor, Jacobean, Victorian, Edwardian, and even Turkish mixed in with the overall French design. Each of the mansion’s four floors contains 4,000 sq ft of living area. All but the attic (the former servant’s quarters) is accessible to the public. Four imported materials were used extensively in the house: French Caen stone for the fireplaces, Honduran mahogany for the dining room paneling, Italian Tournelle buff marble for the dramatic three-story staircase, and Philippine mahogany for much of the woodwork. 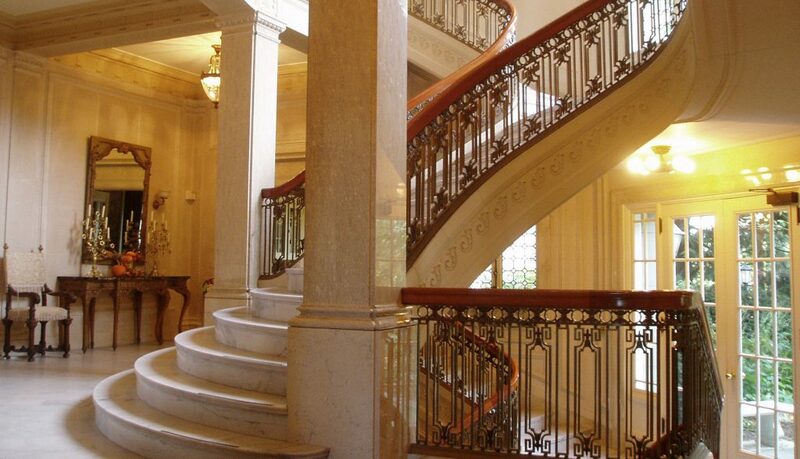 The prominent handrail on the staircase is made of domestic southern gumwood. 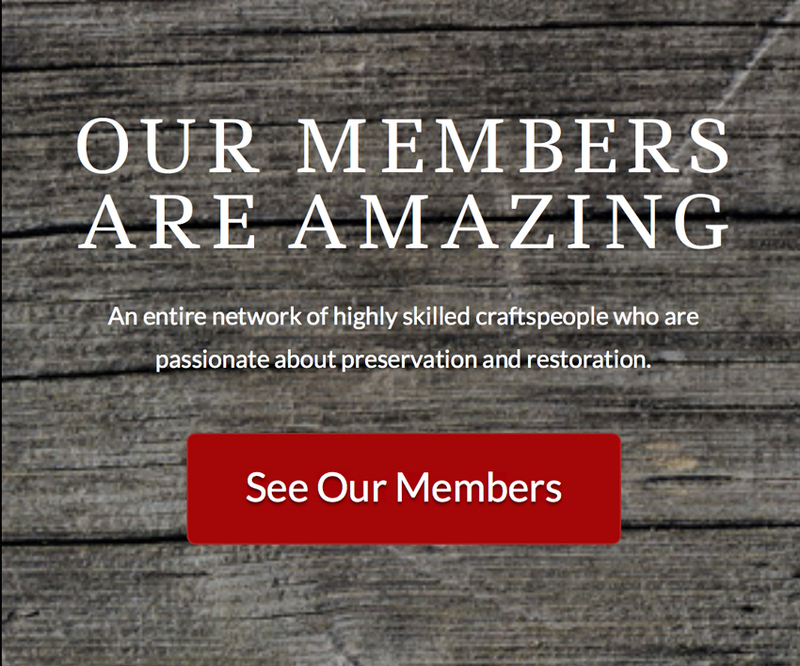 The exterior is composed of Tenino stone quarried from Tenino, Washington. The interior walls are of reinforced concrete, scored to mimic the Tenino stone of the exterior. The mansion was designed with many state-of-the-art features considered daring, even radical, for the time. The in-house elevator whisked family members and guests up and down to each of the four floors. Servants were not permitted to use this device but their tasks were no doubt lightened by the central VAC system installed throughout the house. An intercom system allowed family members to communicate with each other and the servants. Servants could also be summoned by electronic buzzers activated by wall buttons, including those thoughtfully placed beside each bathtub. Indirect lighting is all the rage today, but no contemporary home can hold a candle to the soft indirect lighting cast on the ceiling of the Pittock Mansion’s music room. Three-car garages are likewise fashionable in homes today, but the Pittocks may have been the first family in Portland to sport an intentionally built three-car garage that was not a conversion from a former stable. Today the garage is a gift shop open seven days a week. By 1914 electric light fixtures were becoming standard issue in most new homes. But the Pittocks maintained their electric chandeliers with back-up gas pipes just in case. They further protected themselves from the uncertainties of modern technology by installing house telephones from each of the two-phone companies servicing Portland at the time. The kitchen’s walk-in refrigerator was so far ahead of its time that the concept has yet to catch-on even today (though who knows what features the kitchens of the next 90 years will contain). Likewise, the family’s private gasoline tank and pump have yet to catch on today as an urban household necessity …but, in the future? ?… Sleeping porches are a concept that may be futuristic or dated, depending on one’s perspective. 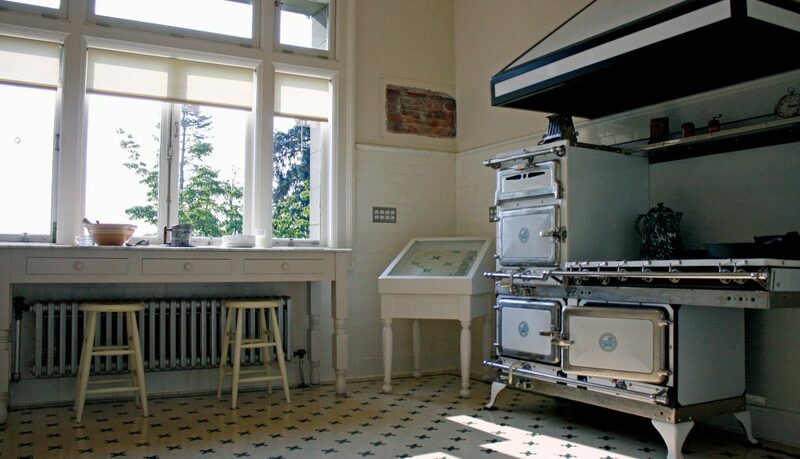 The Pittock Mansion has two — each with its own drain hole to capture any errant rainfall blown in through the open windows. Last, no discussion of the mansion’s technological features can be complete without mentioning the innovative showering system. Showers themselves were still somewhat novel at the time, but the Pittock showers took bathing one step further. Circular chrome tubing surrounded the bather like a vertical CatScan shooting water out in many directions from a myriad of tiny holes in the piping. The spray could be directed somewhat by turning knobs with intriguing labels such as “shampoo” and “liver.” The shampoo knob is for blending shampoo with the water supply, and the liver knob is for a jet to shoot water to the area of one’s liver. It has just been in the last few years that high-end plumbing outlets, offer total-surround showers to the public. In addition to the fine exterior and interior architecture, the mansion is furnished with many outstanding original pieces and other age-appropriate acquisitions. There is also a small gallery in the downstairs social room that hosts rotating exhibits. The park-like grounds are well maintained and provide perhaps the best viewpoint of downtown and Mt. Hood. For all these reasons, the Pittock Mansion remains a favorite destination for visitors and residents alike. 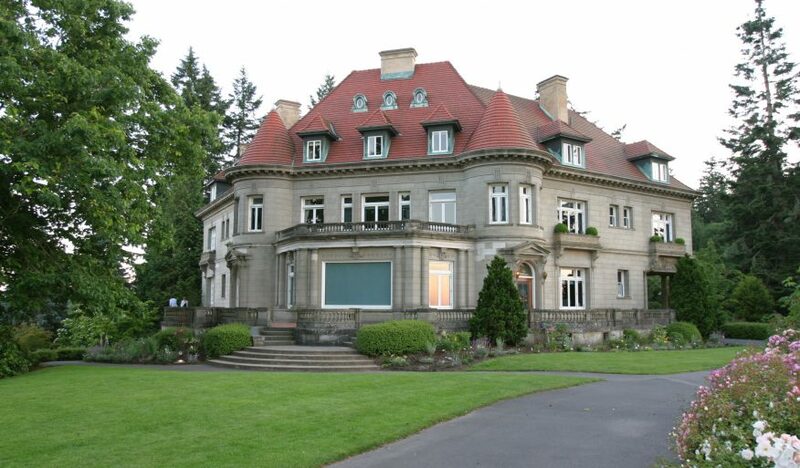 To tour the Pittock Mansion, or for more information, call 503-823-3624 or visit www.pittockmansion.com.